In this handout from New York State Police, convicted murderers David Sweat (L) and Richard Matt are shown i n this composite image. Matt, 48, and Sweat, 34, escaped from the maximum security prison June 6, 2015 using power tools and going through a manhole. On June 6, two murderers were discovered missing from an upstate New York prison. The faces of David Sweat and Richard Matt made front pages across the Northeast as the details of the dramatic escape and manhunt unfolded. But after two weeks, interest has trailed off. Even freshly reported sightings failed to bring the story "above the fold" over the weekend. As TV cameras and reporters chase the next big story, the Dannemora fugitives still haven't been caught. On the first day, they were probably near the prison, but today they could be literally anywhere. Here's where they could be if they walked 25 miles per day or drove 500 miles per day. What also helps the fugitives is that as people forget about the story, they are less likely to look at their photos, remember that they are even on the loose, or be focused on staying vigilant. This is exactly what you would think Sweat and Matt want, so they can more easily integrate around other people—hoping nobody notices. 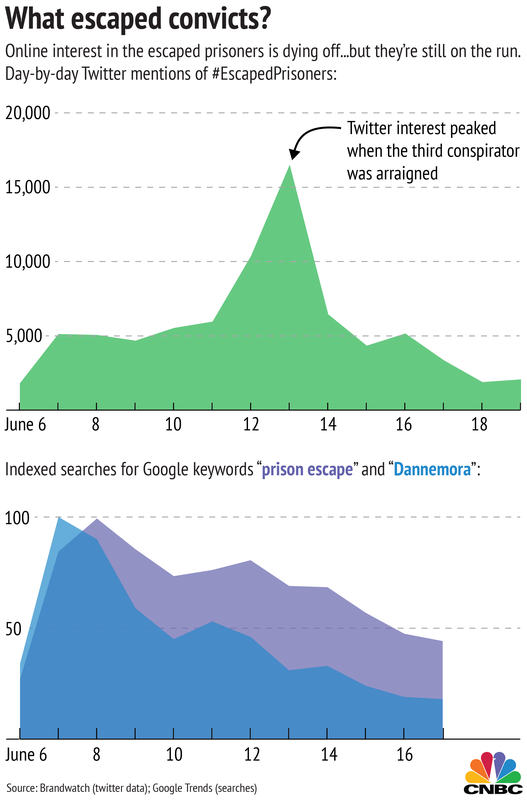 Here's how interest in the story declined between the day of the escape and the end of last week.